A hearty welcome to all of you newcomers to the “Small Town Memories” community. I hope the stories on this site inspire you to share your own memories of living in the Sharpsville area in or around the 1950s through 1970s, whether in a short comment or a longer narrative. Corrections to existing stories are also welcome. Just use the Comment box at the end of any blog or attach your writing to an email to bissella9@hotmail.com. On the far side of Sharpsville, PA, children attended an elementary school in a large brick building with the name of Deeter. On one side of Deeter was a narrow two-story wood frame structure that we called the Canteen. In the early 1950s, the Canteen was one of the few places that we Sharpsville teens could gather for fun and games with others our own age. Canteens for young people in the community, as well as for soldiers, evidently existed during the war years when restless teens had little to do outside of school and faced an uncertain future. According to a 1944 guide for setting up a youth center, prepared by the Associated Youth-Serving Organizations, Inc, “Youth likes to feel that it has a place similar to that of the soldier or sailor and with the same type of activities” and therefore encouraged such amenities as a game room, jukebox, snack bar, and dancing in a co-ed atmosphere. 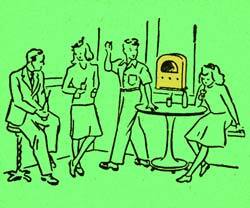 By the 1950s, however, teen troubles were viewed somewhat differently. Juvenile delinquency was in the news and communities were seeking ways to assure that their young people weren’t among those who fell into such antisocial behavior as vandalism or violence. Here on Friday nights, parents volunteered to chaperone seventh and eighth graders as they danced to music from a jukebox (upstairs) or played ping-pong or table-top shuffleboard (downstairs). The girls tended to congregate upstairs and usually jitter-bugged together to Fats Domino or Chuck Berry and the Comets songs or sat at the little tables drinking cokes and eating chips. The boys massed downstairs around the shuffleboard table or played ping-pong. Never once do I remember a boy dancing at the canteen. In spite of this gender separation, it was here that courtship rituals began that would last until graduation. We were all very carefully checking each other out. Teen canteens exist to this day, such as the aptly named CanTeen, a current program in Cicero, New York. 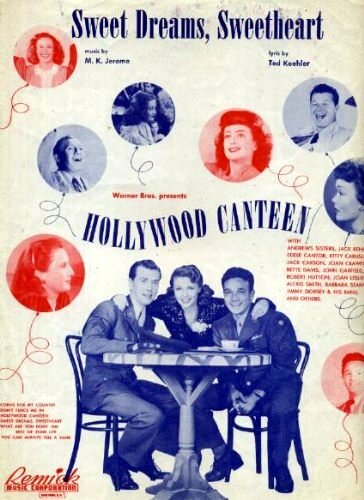 It is interesting to note that CanTeen’s focus is “to keep youth safe and entertained during their out of school time.” During the past seven decades, the purpose of canteens seems to have evolved from keeping youth busy in the 1940s, to keeping them out of trouble in the ’50s, to keeping them safe in today’s even more worrisome times. But all such organized social programs have tried to create an environment that would mold young people into responsible and upstanding adults. Not an easy job and not 100 percent effective, but it has been worth the try. When did you leave 2nd St? Never forget as a very young child my mother calling police because for days a car with two men would be parked on our hill. One morning my Mother took my sister to school and drove down your part of 2nd to pick up another girl; car followed as she drove through your alley. Police investigation began. Turned out to be The FBI. Was gambling going on in one of the buildings near you and they thought my Mother was making pickups every morning. Crazy! My aunt cleaned in that building for them.Her son was around your age.His name was Mike Gula. I don’t recall the name Mike Gula, but maybe other readers knew him. Ann,I grew up at 21 South Second.Were you near the tracks?I would have been much younger having grown up in 70’s. Did our family live near the tracks?! You bet we did! The building we lived in consisted of an apartment upstairs and my father’s print shop below. Only a narrow yard and a slope separated us for the heavy rattle and vibrations of the steam engines that pulled heavy loads of coal to the blast furnace. By the 1970s, the building became the headquarters of the Cattron Group, known for their remote control applications. That business would have been during your time on Second Street, so maybe you remember it. I spent 6 years at Deeter Ele. and lived just up the street. It was RED. Painted brick. Thanks, Janet, for your correction, which I will make to the article. I don’t remember why I thought the bricks were yellow. It reminds me that my memory isn’t necessarily accurate, so I do need my readers’ help!